Five Nights at Freddy’s is what’s called a point to click game. This means it doesn’t require a lot of character movement making it a simple game to control. It is an indie survival horror video game developed by Scott Cowthon over 3 years ago that has became a popular game with teenage kids. This game is available for all mobile markets and PC. Due to its popularity, a book was released, a movie deal in the works and 4 spin off games since this first original came out. 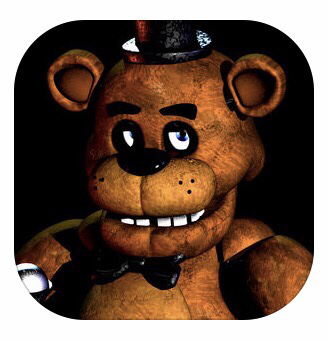 The goal for the player is to survive five nights at a business called Freddy Fazbear’s Pizza while avoiding getting caught and killed by the animatronic characters by tracking their movements via the restaurant’s security cameras. The game is very dark and developers encourage you to play with headphones in to become more involved with the creepy music of the game and the pop up in your face scare tactics. The games business you are playing inside of reminded me of a possessed Chuckee Cheese run down restaurant setting. Those Animatronic characters are scary enough. Without them coming to life at night. The game begins and describes your new summer job at Freddy Fazbear’s Pizza (where kids and parents alike come for entertainment and food as far as the eye can see!). The main attraction is Freddy Fazbear and his friends Chica, Bonnie and Foxy. The characters are creepy looking animatronic stuffed animals. The story revolves around the robots behavior at night. You are a new hire since it was much cheaper to hire you as a security guard than to find a repairman for the characters. From your small office you must watch the security cameras carefully. You have a very limited amount of electricity you’re allowed to use per night. That means when you run out of power for the night then no more security. If Freddy Fazbear or his friends aren’t in their proper places, you must find them on the monitors and protect yourself by opening and closing doors. The monitors are the security cameras positioned throughout the restaurant to observe the animatronic characters. The player has a limited amount of power to view camera feeds, light hallways, and close the doors on either side of them. You must use this camera feed inside the building and hold the animatronics off using the doors. If the player fails to do this, they will be scared and told Game Over. To advance to the next night, the player must survive from 12:00 AM to 6:00 AM (8 minutes and 37 seconds in real-time, 4 minutes 30 seconds on the mobile edition). Then It’s on to the next round. So what makes this game scary and a moderate threat level? I can see where teenagers would think this is a funny kind of scare tactic game, but for kids under the teenage years, I can tell where this would be scary. The animatronics in the game are stuffed animals. Anytime you take an innocent stuffed animal toy and turn it evil by making it come to life and attack you…. then my guess is that your small kids are not going to like being around their stuffed animals at night time. This would be because in the game at night is when they come to life and try to kill you. FNAF is definitely not recommended for children under 13 years of age (or scare easily). I think it is safe to say that if your kid can watch a pg-13 scary movie then this game will be fine for them to play. Remember this game went viral which stemmed several sequels, toys, a book series and a future movie that is in the works. The sequels that are similar to the original with new story lines and new characters are still the same threat level as this review due to the nature of the games all being similar. December 1, 2016 – a free update containing the ‘Custom Night’ became available for Sister Location.